Effective enzymatic hydrolysis of lignocellulosic materials to produce fermentable sugars requires close cooperation between cellulase components. However, lignin remaining in the pre-treated substrate plays an inhibitory role in the synergistic action of enzymes through irreversible adsorption. 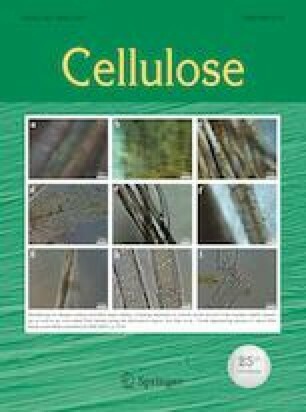 In this study, the effect of cellulolytic enzyme lignin (CEL) isolated from pre-treated furfural residues and dissolved lignins (DLs) precipitated from black liquor on cellulase and cellobiase adsorption behavior was investigated. Green liquor (GL) combined with H2O2 (GL-H2O2) or ethanol (GL-ethanol) pre-treatments markedly decreased the adsorption capacity of CELs. However, the DLs had the strongest binding ability, which was approximately two to three times higher than that of CELs. According to SDS–PAGE analyses, only CBHII and EGII in cellulase and enzymes of 245 kDa and 55 kDa molecular weight in cellobiase were easily bound onto CELs and DLs. Solid-state 13C NMR spectra and FT-IR analysis indicated that pre-treatments reduced the hydrophobic structure of aromatic rings, β-O-4, and carbonyl, and increased the number of hydrophilic carboxyl groups in CELs. For this reason, the hydrophobicity of CELs was decreased, thus reducing their adsorption capacity. Compared with GL-H2O2 pre-treatment, GL-ethanol pre-treatment had a stronger effect on decreasing enzyme adsorption of lignin due to its high hydrophilicity. Heavy damage to aromatic structures, low molecular weight, and the large number of aliphatic portions in DLs caused their strong affinity for enzymes, although their BET surface area and hydrophobicity were low. This work was financially supported by the National Natural Science Foundation of China (No. 31800500), the Key R&D project of Shandong (Nos. 2018GSF121031, 2017GGX40106 and 2017GGX70102), the Applied Basic Research Foundation of Qingdao (Nos. 17-1-1-52-jch and 18-2-2-4-jch), the Taishan Scholar Program of Shandong (No. ts201511033), and the Open Project of Guangxi Key Laboratory of Clean Pulp & Papermaking and Pollution Control (No. KF201802-5).